After yesterday’s big win against Nottinghamshire, Berkshire’s Beavers were brought crashing back down to earth as Yorkshire chased down 104 in less than 15 overs. Needing 105 to win, Yorkshire skipper Lauren Winfield hit 42* and her England colleague Katherine Brunt 41*, including 3 sixes, two of them consecutively off Fi Morris, as the Vikings romped home for the loss of only 1 wicket – Beth Mooney, caught behind by Berkshire glove-butler Carla Rudd off Heather Knight for 8. But it was earlier in the day that the damage had really been done. 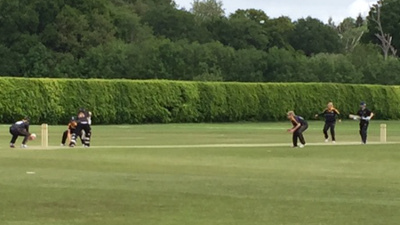 Berkshire captain Heather Knight won the toss, but might soon have been regretting electing to bat, as she was first back to the pavilion – caught by Mooney off Katie Levick for 16. Wickets fell steadily thereafter, with only Alex Rogers (24) offering any real resistance as England’s Dani Hazell ripped through the Beavers’ middle order, taking 6/28. Only Alex Blackwell was perhaps somewhat unlucky – caught behind, as Lauren Winfield (at slip short leg) turned to evade a powerful sweep shot and the ball ballooned back up off her leg for Mooney to take the dolliest of dollies. Winfield later took a terrific low one-handed catch at slip to dismiss Sherissa Gumbs. With the Women’s Ashes now coming into view over the horizon, it was certainly a performance to gladden the hearts of England fans everywhere; and with Katherine Brunt also looking as sharp as a new bag of nails, it’s setting up nicely to be an exciting summer ahead. Blackwell’s dismissal was very bizarre and a game changer. Winfield had infact moved from slip to short leg that very ball – Blackwell pulled a short one into her leg and it ballooned to Mooney. Nice variation of flight from Hazell throughout her spell.